Beannachtaí na Féile Pádraig oraibh! That’s Irish for ‘Happy St Patrick’s Day everyone!’ To get a bit of Irish flavor, we’re taking a look at how Dublin, the capital city of Ireland, turned to transit to beat traffic gridlock. Founded by the Vikings in the 9th Century AD, Dublin grew to become the largest city in Ireland with a population of 1 million by the 1970s. Dublin is a low-rise city, and with the Irish Sea to the east limiting development, the city sprawled out into surrounding towns and countryside. Faced with increasing traffic, the Irish Government took the decision in the late 1970s to invest millions into modernizing the rail system around Dublin. The ‘Dublin Area Rapid Transit’ or ‘DART’ was born in 1984. 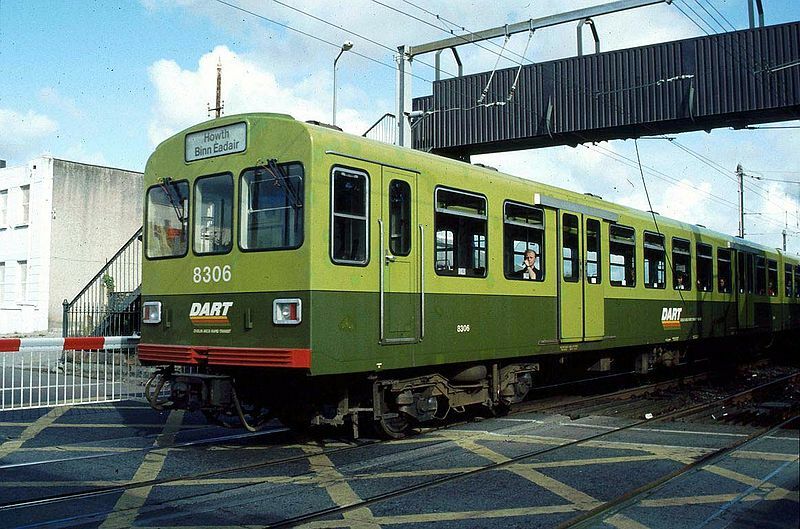 With modern, cheerful green coaches and efficient, electrified service, the DART quickly became a Dublin icon, whisking people in and out between Dublin’s suburbs and downtown. Inevitably, there were objections at the cost of spending taxpayer’s money on transit. However, the trains were packed full of happy Dubliners, and property prices leapt as a consequence of the increased ease of getting around and sense of modernity that came with the little green trains. As the years went by, the service has expanded and there are plans to further develop the network. However, despite the success of DART, traffic in Dublin is still absolutely terrible, mainly because the city has grown enormously by drawing in Irish people from throughout the island. The government has responded by planning new streetcar lines (called ‘Luas’, which is Irish Gaelic for ‘speed’) and opening a municipal short-term bike rental scheme to give Dubliners more options for getting around. Dublin has managed to develop its transit network despite an Irish economy that has alternated between booms and tremendous crashes. What was possible in Ireland is also possible-and necessary-here in the Princeton area. We have ripped out our streetcar network and our trains and buses have barely improved in decades. It’s about time to get serious about transit in the Central Jersey area, or we won’t be able to get around as the population continues to grow. Let’s join the Irish not just in the Guinness but also in improving our transit infrastructure! This entry was posted in Sustainability, Traffic, Transit. Bookmark the permalink.